Hello, People. 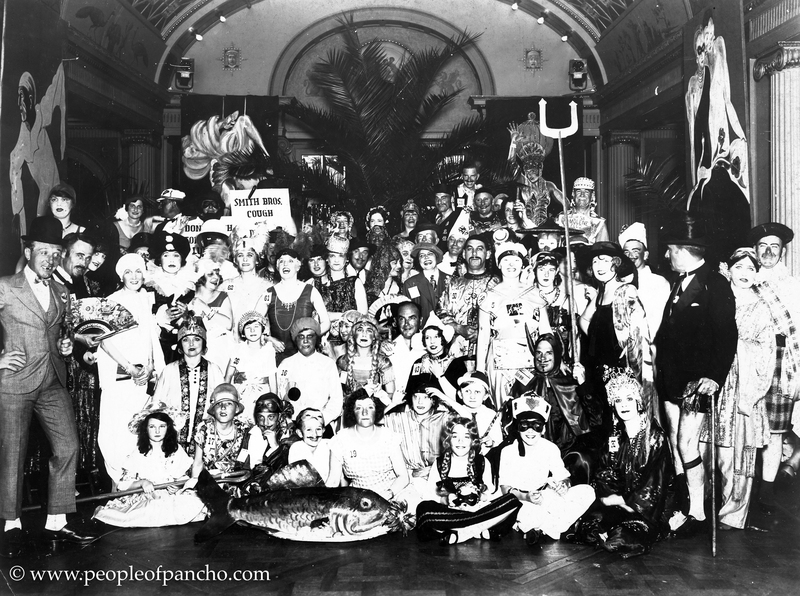 Here are some fun party pictures for you, taken in the months before the stock market crash in October of 1929. 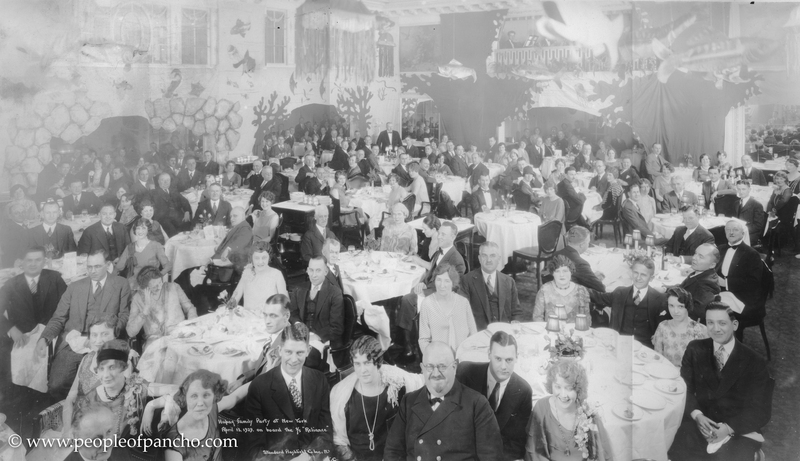 First, we begin with what looks to be a fairly lavish Hamburg-Amerika Line company party in New York, aboard the SS Reliance on April 13, 1929. My Great-grandpa Leo Lessiack is at the first table in the bottom right of the photograph, seated third from the right wearing a dark suit, arms spread wide, big smile. I have scoured the image for my Great-grandma Margaret, but I don’t see her anywhere. Maybe she stayed home with my Grandpa Bob, who was only seven at the time. This photo was too large to fit entirely into my flatbed scanner, so I scanned it in two parts and then my husband stitched it back together for me in Photoshop. It’s worth clicking into it to look more closely. I love what a perfect time capsule of actual 1920’s fashion it is. Nearly every woman has her hair styled in finger waves, the men all look so F. Scott Fitzgerald dapper, and lordy the pearls and jewels make me giddy. It looks like there’s a live band up there in balcony toward the back, and somebody went to a great deal of trouble to achieve that under-the-sea decor, complete with big fish swimming through the air. Now, if I ran a shipping company, I’m not sure that “under the sea” would be my preferred theme for a party aboard a ship, but maybe I’ve watched Titanic one too many times. The SS Reliance featured heavily into the family travels throughout the Caribbean in 1929, which will be the subject of my next post. And, this was not the only party the family attended on board that ship. 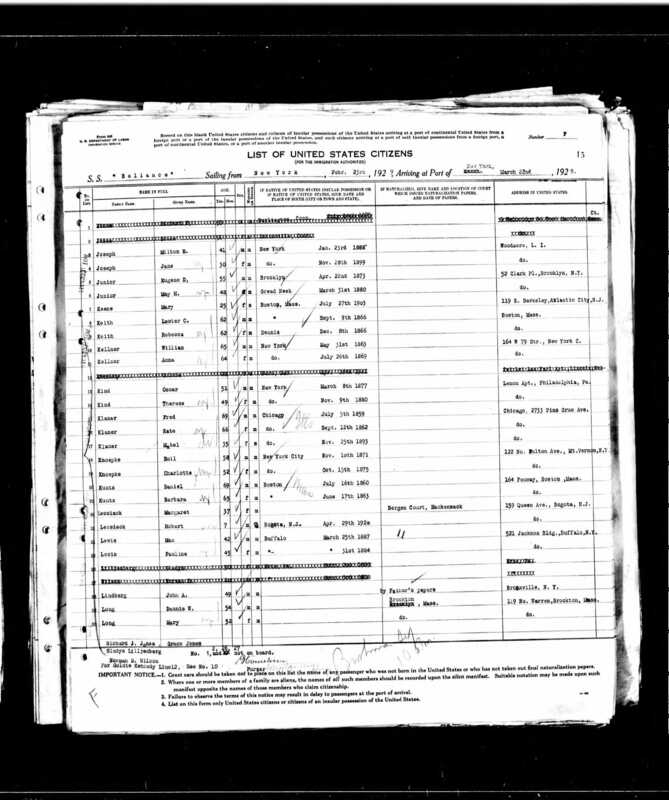 I’m still searching for all the manifests related to the trip, but the one I have found indicates that only Great-grandma Margaret and Grandpa Bob sailed from New York on Feb. 23, 1929. Perhaps that explains why Great-grandpa Leo is not in any of these party pics (and even Margaret seems to make herself scarce). 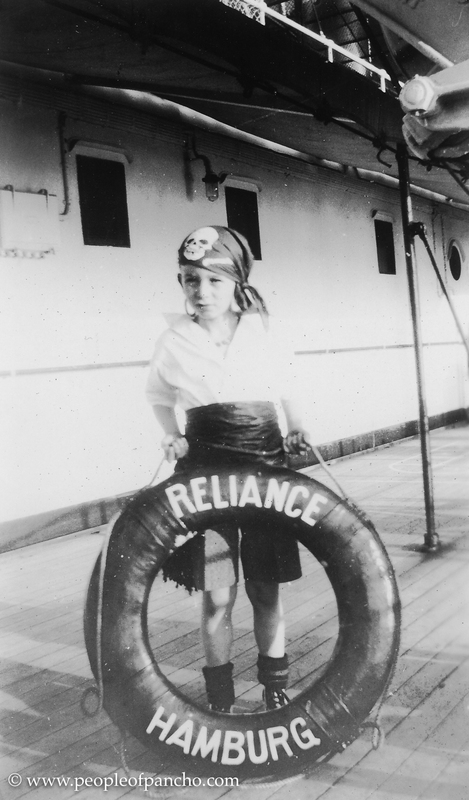 “Pirates Day, SS Reliance, Feb. 25, 1929.” Grandpa Bob is party ready. These people all look rather drunk to me. Grandpa Bob is in the bottom left-hand corner. Great-grandma Margaret is nowhere to be found, but maybe she is hiding behind the scimitar in the second row just behind Grandpa Bob. Again, pirates would not be my theme of choice for a party aboard a ship that was actually at sea IN THE CARIBBEAN, but maybe I’ve watched/ridden Pirates of the Caribbean one too many times. It’s a good thing I don’t plan parties for a living, because I would be guaranteed to overthink everything. 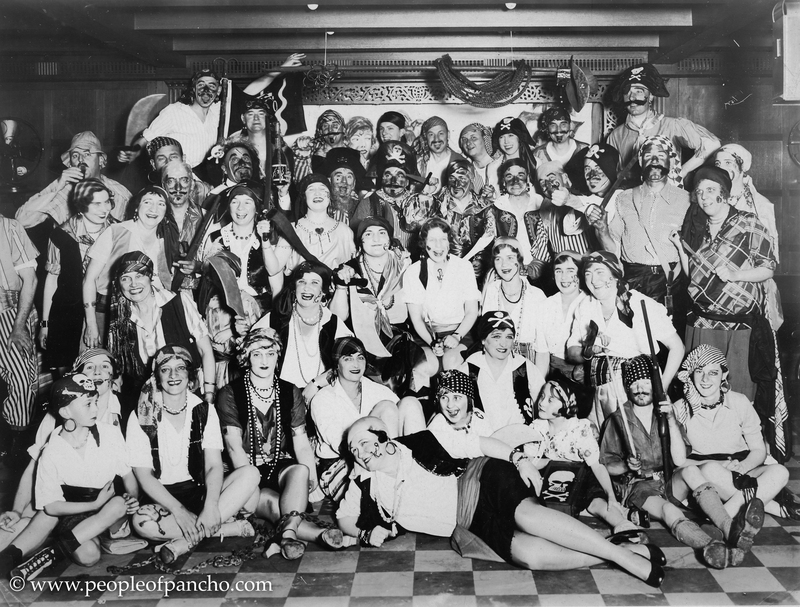 Here’s yet another party pic from the raucous voyage of the SS Reliance in 1929. My Grandpa Bob is again in the front row, this time grinning behind the giant fish. It’s a little hard to tell exactly what the theme of this party is, other than perhaps chest colds that require Smith Bros. Cough Drops. Once again, everyone looks pretty drunk, and once again my Great-grandma Margaret is making herself scarce. Maybe she is wearing the tiny white hat wedged between cone-head-guy and the samurai-hat-guy (or whatever the heck that thing is). You know, I think that despite that the anxiety producing party themes, I would vastly prefer traveling partying by ship to traveling wedged into veal class in the air. These people look like they’re having a lot of fun. Ha. Quite a motley crüe in the third party photo. Sort of Sergeant Pepperish. My top hat is off to the Top Hat guy with no pants. We are here to par-tee!!!! A really big switch from the stoics in photo 1. Is that Robin Lane in the Purina Feed bag-shirt in the last photo? Another life. I believe that a lot of alcohol was involved in the making of that photo! People back then knew how to make their own fun – you can bet they’re having a ball!! I swear I see Grace’s face in the profile photo of my dad in the lower left of the middle photo. My dad was such a shy man — never out front for anything — that I have a hard time reconciling these party pics with his personality. Grandma Margaret was able to bring out a side of him I never knew. Or maybe she chased it away before he became my dad! Love seeing these pics! Notice that she herself either hid behind something or someone else, or wasn’t in the photos at all. Maybe she is where he got his shyness from. It sure wasn’t Grandpa Leo! I also wonder what’s in the “book” or collection of papers my dad seems to be sitting on? Maybe that’s how he really entertained himself on these journeys? I didn’t even notice that! Yes, now I wonder too. I’m glad you’re enjoying it, Fran. Thanks for reading. Veal class!!! Hahaha. 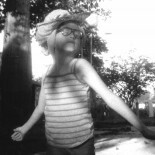 Wow, these photos!!! What a hullabaloo! Or is it shindig? Or are those from the 50s and 60s? I am blown away by the amazing pix you have! Those are from 1929 — my great-grandpa Leo kept a lot of photos, thank goodness. Looks like a pretty good time before the great depression showed up Thanks for visiting! Take less than a year before the start of the Great Depression is pretty amazing just by itself. But there is so much that is phenomenal about them! They knew how to have fun in 1929! And, looking back, knowing that the stock market crash is about to occur, makes these photos even more interesting. Wow! Those are some photos – and aren’t they all having fun! Great! This entry was posted on April 8, 2018 by Pancho in Lessiack People, Spielmann People and tagged Franz Georg Leopold Lessiack, gen, Geneabloggers, genealogy, Hamburg-Amerika Line, Hamburg-Amerika Linie, HAPAG, Margaret Spielmann Lessiack, Robert Lessiack, SS Reliance.